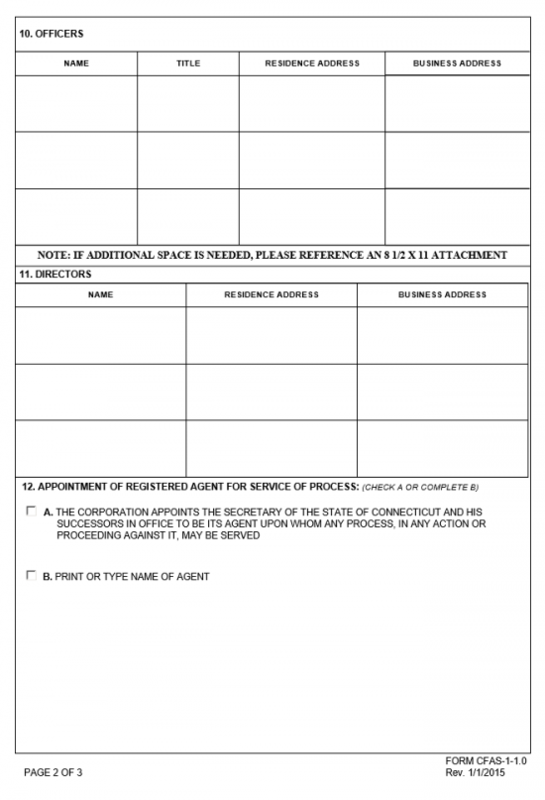 The Connecticut Application for a Certificate of Authority Foreign Corporation | Form CFAS-1-1.0 must be submitted to the Connecticut Secretary of State when an out of state entity wishes to conduct business as any type of corporation within the state borders of Connecticut. Any entity wishing to do so must do so under its true name unless this name is unavailable for use in Connecticut. If this is the case, the entity must assume a fictitious name to operate under until its true name becomes available. It is important to note this corporation may not assume a fictitious name to conduct business under in this state if its true name is available. 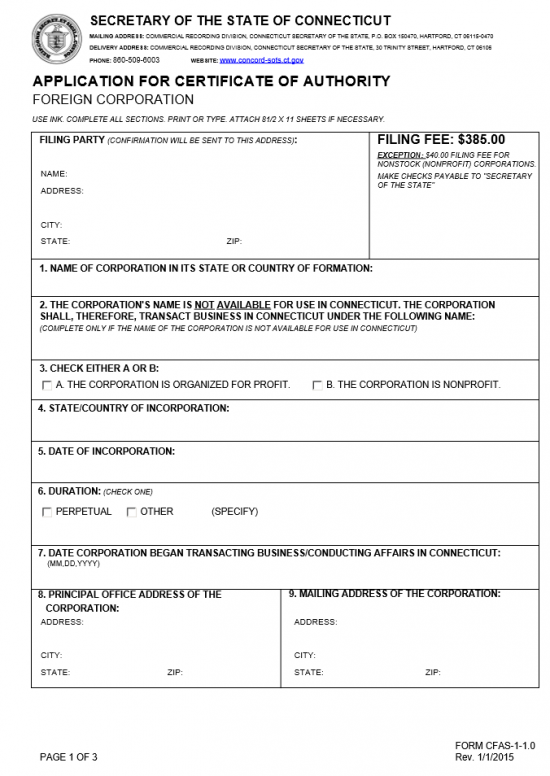 This form will, when submitted properly, will allow an entity the authority to create and operate both non-stock (or Nonprofit) and stock (For-profit) corporations in the State of Connecticut. This will require the completed original, any required documents, and full payment of the filing fee. The filing fee will be $385.00 for a stock corporation or $40.00 for a non-stock corporation. All checks should be payable to “Secretary of State.” You may mail the filing to Commercial Recording Division, Connecticut Secretary of State, P.O. Box 150470, Hartford, CT 06115-0470 or you may hand deliver the filing, in person, to Commercial Recording Division, Connecticut Secretary of State, 30 Trinity Street, Hartford, CT 06106. Step 1 - In the section labeled “Filing Party,” report the Name, Address, City, State, and Zip Code of the party that is submitting the Connecticut Application of Authority Foreign Corporation | Form CFAS-1-1.0 with the Connecticut Secretary of State. This will be the same party that will receive confirmation and other communication from the Secretary of State. Step 2 - In Item 1, enter the name of the corporation as it is known in its origin state. This is the corporation’s true name. 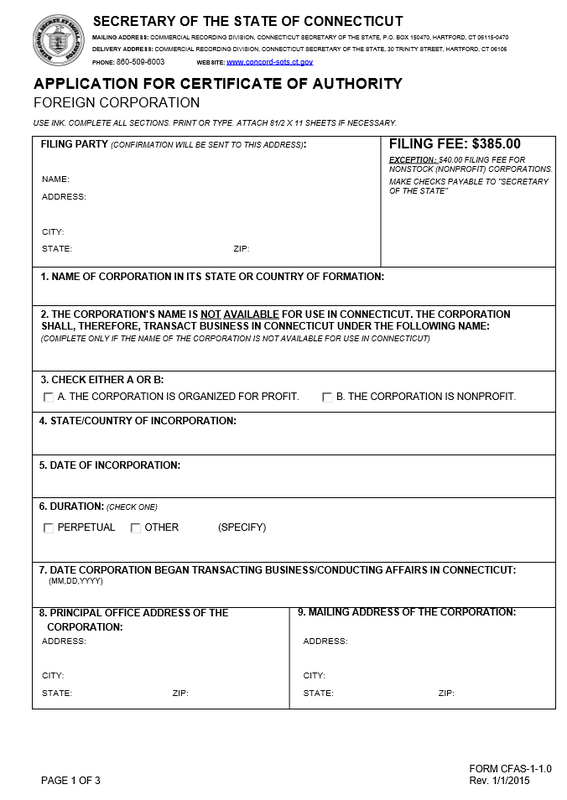 Step 3 - If the true name of the corporation is not available for use in the State of Connecticut, then enter the fictitious name this entity will conduct business as. Note: This section should be left blank if the true name of the corporation is available for use in Connecticut. Step 5 - In Item 4, report the State and Country where this corporation first formed. Step 6 - In Item 5, enter the Calendar Date of this entity was originally incorporated. Step 7 - In the section labeled, “Duration,” report how long this corporation will exist. If there is no specified date where it will cease to exist place a check mark in the box labeled “Perpetual.” If there is a specific time period or circumstance where this corporation will cease being active, place a check mark in the box labeled “Other,” then specifically document the date or circumstance in the space provided. Step 8 - In Item 8, report the Street Address, city, State, and Zip Coe where the Principal Office of this corporation is located. Step 9 - In Item 9, report the full mailing address for this corporation (Street Address, City, State, and Zip Code). Step 10 - In Item 10, “Officers,” report the Name, Title, Residence Address, and Business Address for each Officer in this corporation. Every officer must be reported here, if there is not enough space, in the table, continue the list on a separate sheet of paper (8 1/2″ x 11″) and attach it to these articles. Step 11 - In Item 11, “Directors,” you must report the Name, Residence and Business Address of each one. Each Address must contain the Street Address, City, State, and Zip Code. 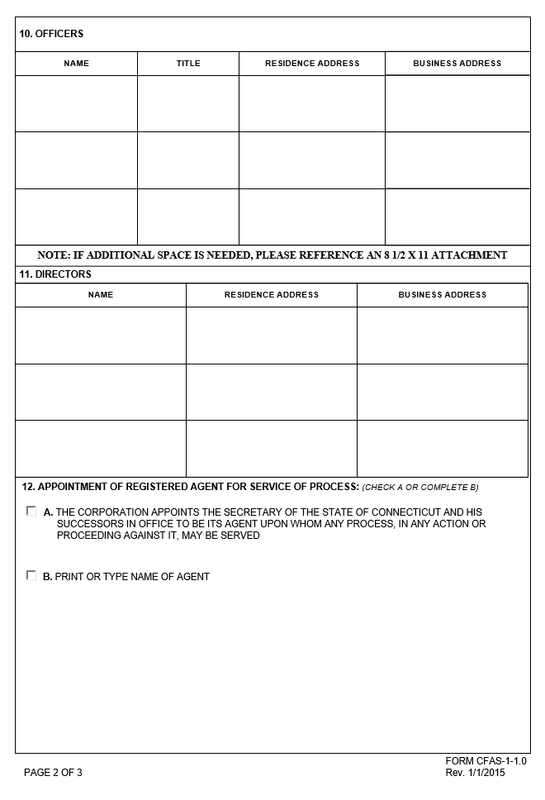 Step 12 - In Item 12, you must elect to either have the Connecticut Secretary of State serve as the Registered Agent who will receive all court documents being delivered as a result of court action against the corporation by choosing the box labeled “A” or you may choose “B” then define the full name of the Registered Agent who has agreed to accept this responsibility when the corporation has proceedings against it. Step 13 - Below this, the Business Address and Residence Address of the Registered Agent. These addresses must give the physical street location, City, State, and Zip Code and must be located in the State of Connecticut. Below this, beneath the heading “Acceptance of Appointment,” the appointed Registered Agent must sign his/her name. Step 14 -. The default method of communication for the Connecticut Secretary of State is email. Thus, in section 13, enter the Corporation Email Address. If the corporation does not have an email address, write the word “None.” Note: It is highly recommended to attain a corporate email address for such correspondences. Step 15 - In Section 14, “Execution,” report the Calendar Day, Month, and Year these articles are being completed and signed. 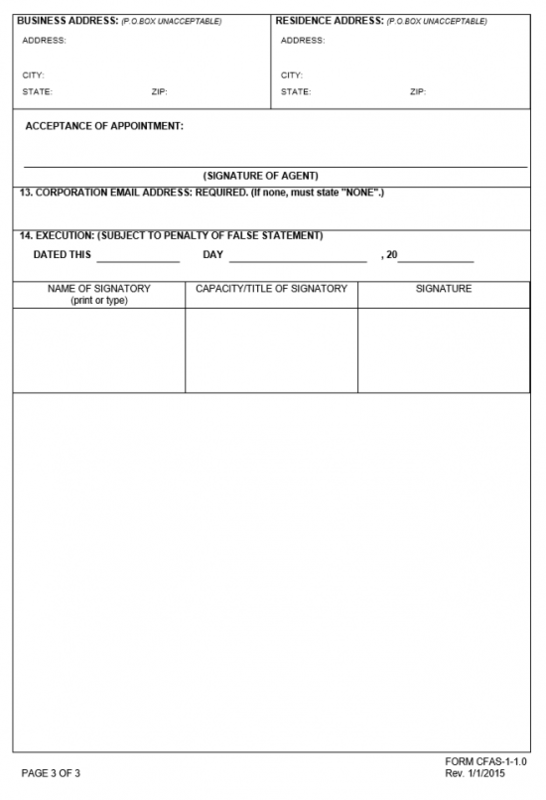 Below this is a table where each Incorporator must print his/her name, report his/her Title, and sign his/her name in the appropriate column (Name of Signatory, Capacity/Title of Signatory, and Signature respectively). Step 16 - Verify that all information has been reported accurately then, gather all required documents for this submittal, the original and completed Connecticut Application for Certificate of Authority Foreign Corporation | Form CFAS-1-1.0, and a check, payable to the “Secretary of State,” for the full payment of the filing fee ($350.00 for a For-profit Corporation or $40.00 for a Non-profit Corporation) and submit it to the Commercial Recording Division of the Connecticut Secretary of State.